My hair hasn’t been this happy in a long, long time. Himself’s mother gave me a lovely set of Schwarzkopf hair products for my birthday and (I promise I’m not just saying this for the brownie points!) they are really excellent products. My hair’s quite thick and on the dry side but using the Moisture Kick shampoo, spray conditioner and weekly conditioning treatment has worked wonders and left my hair feeling soft, healthy and hydrated. The packaging is attractive and the products smell and feel great but more importantly, they perform to a very high standard. The range contains lots of powerful ingredients (including Hyaluronic Acid Derivative, amino cell rebuild technology, panthenol and lightweight emulsified silicon oil) that work to smooth and protect the hair while balancing moisture levels. 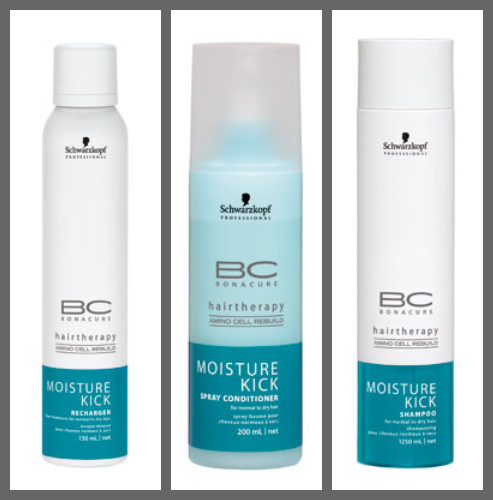 I especially love the Moisture Kick Recharger, a weekly treatment in an unusual gel-to-mousse formula that, after 10 minutes, restores elasticity and provides intense moisture without weighing down the hair. I’ve come to view this as a bit of a miracle product as it leaves my wavy hair full of shiny volume and bounce. These are salon products but you can also pick the range up on amazon for between £7 and £13 and if your hair's a little frazzled or just deserves a treat, then I would highly recommend. Have you tried any Schwarzkopf products and what was your verdict? These sound great. I haven't tried them but I too have thick sometimes dry hair so I'll have to try them out soon. I love the packaging and logo, really simple and nice. At the moment I'm using Dove Intensive Repair shampoo and conditioner and find it is pretty good. I'm loving the look of these, especially the spray conditioner, it looks fab. Really like the packaging too. The price isn't bad either esp as it's a salon product. I too have pretty dry hair and sometimes look like worzel gummidge so this sounds like it's right up my street. Thanks Shoezanne and thanks for reposting after Blogger mysteriously vanished the comments on this post! I really liked the Dove stuff too, but I find this gives it that extra shot of hydration that my hair really needs at the moment.